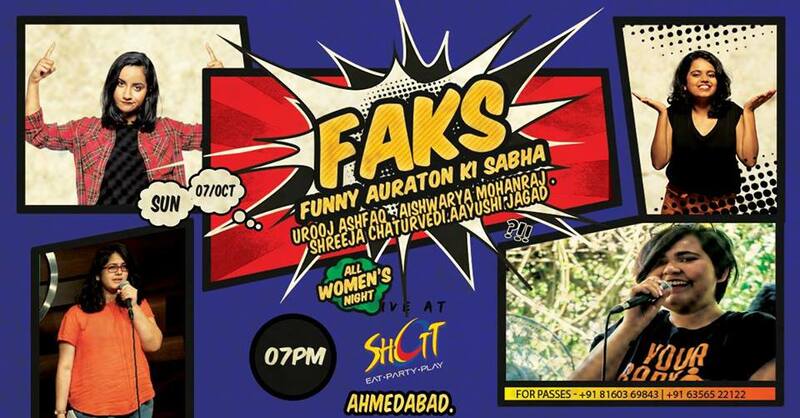 FAKS-Funny Auraton Ki Sabha is a newly designed stand-up comedy event with the tagline of “By the women, For the women, Of the women!” Experimenting shows based specially for the women and looking for new up-coming talents in the genre of comedy. Urooj ashfaq – Urooj Ashfaq is one of the most sought after young talent, among the new generation of comics taking the scene by the storm. Urooj is a 22 year old girl from Bombay, who found her first claim to fame through the TLC show, Queens of Comedy, where she was one of the finalists and a comedy force to reckon with. After the success of the show, Urooj has travelled across the country with her stand up act and performed along side some of the stalwarts, like Kanan Gill, Kenny Sebastian & Biswa Kalyan Rath. Apart from stand up comdey, Urooj has also worked on numerous projects as a comedy writer and put her wits to best use, in both fiction & non-fiction formats. She has also acted in multiple comedy properties (AIB’s If Apps were people, When some is sick sketches). Sejal bhatt – Sejal Bhat is a stand-up comedian from Bangalore who uses comedy to fill the void where her soul should be. She was a top 10 finalist in Amazon Prime Video’s comicstaan and has performed all over India. A former Analyst and editor, she firmly believes in having no concrete beliefs. Ayushi jagad – Aayushi Jagad is a writer and comedian from Pune who is finally happy people pay her real money to write. A former stylist, she made the switch to comedy to write and produce comedy sketches on her you tube channel. She started in comedy working for AIB before doing a short stint on Queens of Comedy. She loves puppies and hates lizards. Shreeja- Shreeja is moderately funny on most days and jokes about her roots with a poker face.